Fennel originates from the Mediterranean. The first records of Florence Fennel being grown date from 17th Century Italy. Florence Fennel is grown for the thick bulb-like bases they develop just above the soil, but the leaves can also be used as a flavoursome herb. The bulbs have a sweet, aromatic aniseed flavour and can be eaten raw, sliced with dips like celery, chopped in a salad, or cooked. Fennel is great when baked or when slowly fried in olive oil to caramelise it and enhance it's sweetness. Fennel seeds can also be collected and used as a spice, they have a similar but stronger flavour to the leaves. In India the individual seeds are coated with sugar to create a lolly with a strong aniseed hit. Fennel plants will bolt to seed when their growth is interrupted and in bulbing varieties this will stop the plant from putting energy into creating a bulb. To ensure continuous growth be such to feed the soil well and water regularly and evenly. Dig lots of organic fertiliser, well rotted manures, worm castings and compost through the soil prior to planting. Mulch around plants well to retain moisture and reduce competition from weeds. Don't disturb the roots of your Fennel plants when weeding as this too can cause your Fennel to bolt to seed. Mound up mulch against the bulb as it develops to shade it from the sun and create the blanched base seen in store-brought bulbs. Harvest bulbs as soon as they are fully grown, about 8cm across. If fully grown Florence Fennel plants are left to flower they'll draw from energy reserves in the bulb shrinking it in the process. If you cut the bulb off at soil level when harvesting leaving the roots intact they'll continue to produce feathery shoots that can be used as a herb in other dishes. Fennel that is left to flower will attract lots of beneficial insects such as predatory lacewings and hoverflies to your garden. Sow Florence Fennel seeds from November to February in cooler regions of Australia, from February to May in temperate regions of Australia, from March to May in subtropical regions of Australia or from April to July in tropical regions of Australia. Sow Florence Fennel seeds 6mm deep spacing plants about 15cm apart to allow enough room for the bulbs to develop. Florence Fennel takes between 8 and 14 days to germinate once sown. 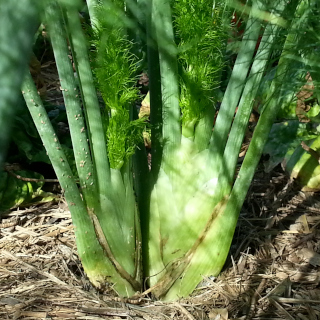 Florence Fennel bulbs will be ready to harvest 12 to 14 weeks after sowing the seeds. Fennel leaves can be harvested as soon as they are big enough to pick.